This multi-functional outdoor device is made from recycled paper. Keep tabs on the time, temperature, and phases of the moon, all with a small carbon footprint with this handy, handsome device. It's produced from 210 sheets of recycled paper transformed into a slate-like material, but amazingly, it's completely waterproof and stands up to outdoor use. The multi-function thermometer clock is great for predicting tidal heights, peak gardening times, and the threat of lunacy! Made in Perrenporth, Wales, UK. Dan Dicker left his previous job as a product designer/inventor at Dyson and moved to Cornwall in order to realize a long-held desire: to live and work "a short walk" from the sea. His designs have come a long way in the past decade, evolving from his initial line of tide and time clocks. For Dan, the key to staying competitive in the global market from a shed in Cornwall has always been to design and manufacture unique, functional products. He's no longer in that shed, but his philosophy is still the same...and most importantly, he's still just a short walk from the beach. Designed for use indoors or outdoors; waterproof. Requires 2 AA batteries (not included). Claw tooth hangar on back for easy hanging. I was very happy with the quality of this. I got this for my dad for Father's Day a few weeks ago. When I went to visit him last weekend, he had it hung up on his back deck. I asked him how he liked it and he said it's an attractive looking plaque, but the thermostat doesn't work. We were outside in Florida in the heat of the day when the temps were in the mid-90s, and sure enough the thermostat read 79. It was nowhere near 79. Moonphase and time worked fine, but I'm rating it low because I wanted all the elements to work properly (since I assumed they would), and they don't. Overall not happy with the purchase and wouldn't recommend. 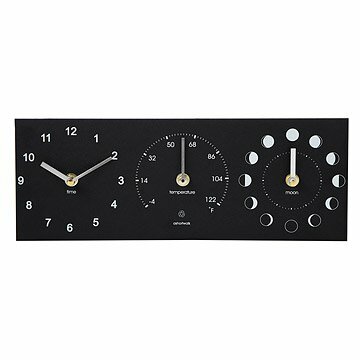 Sharp time and moon clock, keeps temperature accurate. The time piece hands were loose and crossed so hand would not move. The moon dial didn't work at all. The tide dial worked perfectly. Great item if all parts were functional. This was truly the perfect father's day gift. Sleek design, easy to read, and made to withstand weather. Love it! I bought this for my office. I needed an easy to read/see clock, the temp gauge is nice but I have not been able to adjust it - it seems to read about 5 degrees lower than the thermostat registers, and the moon phase dial is just a fun addition. I thought it would have some method of standing on its' own, however, it's really designed to be hung from a wall. The back is open, though the various mechanisms are covered in water tight enclosures. It is hung by a flange on the temp gauge. The material used to hold everything and that the gauge faces are printed on really looks like slate, and appears to be very sturdy. It is a simple and clean design; my only change would be to create a stand that would allow it to be used on a desk, and to look good doing so. I love the concept of this piece, I just wished all parts worked as well as the clock. Great design - all things I need to know at a glance. The thermometer needle has not moved since I got it, though temperatures have been yo-yoing all week. The moon phase is moving a bit more quickly than the actual moon, but it still looks cool. If accuracy is desired, this piece is not for you. If you want a cool clock, go for it!